North East Scotland College student Janice Linton scooped an award for her mattress headboard design. A young designer will sleep easier after scooping a prestigious award for her unique mattress headboard. 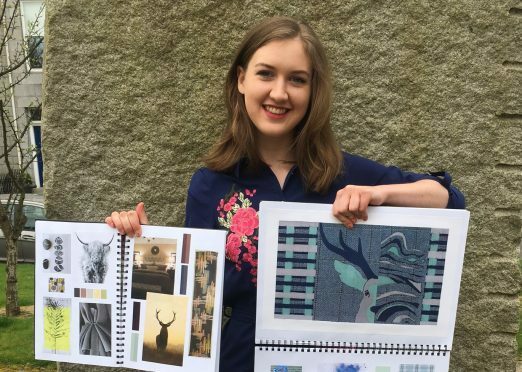 North East Scotland College student Janice Linton, 24, won the collaborative design competition, in association with bed and mattress manufacturers Glencraft, for her Scottish heritage-inspired work. The 24-year-old worked on her design over a three-month period as part of NESCol’s fashion design and manufacture course’s creative textiles module. More than 15 students submitted their designs for consideration before they were judged by Glencraft’s chairman, Duncan Skinner and general manager, Graham McWilliam. Miss Linton said: “Considering the standard of my fellow students work, I’m delighted to have won the competition and I’m excited by the potential opportunities which may come from this and support my future career. The project was launched last year with students being given an interactive tour of Glencraft’s factory, where 46 people with a variety of abilities and disabilities, are employed. From there, the importance of design, costs, practicalities and deadlines were highlighted and discussed to give students a realistic reflection of design in practice.